A little fatigued here at KB HQ this week, but episode 28 still has some juicy news for you on the Indie Burgh Yarn Crawl, a new yarn from Blacker and I have had my spindle out spinning some lovely fibre from Fondant Fibre. You can listen on iTunes, via the Podcast App, Stitcher Radio and PlayerFM. 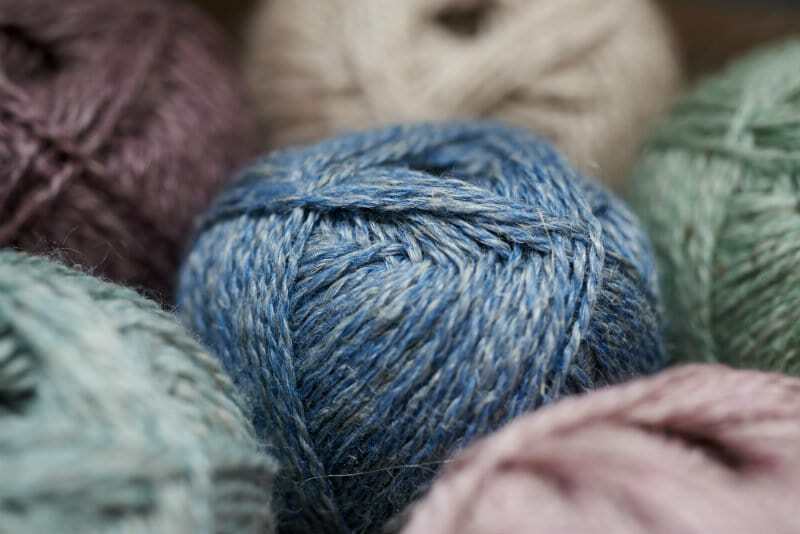 Jess, from Ginger Twist Studio, spills the beans on the Indieburgh Yarn Crawl, this year happening on 13th & 14th June, again in collaboration with the other Edinburgh LYSs Kathy’s Knits and Be Inspired Fibres. In addition to the crawl there will be classes this year taught by Clare Devine and lots of time for socialising, including a Night Out With Socks. Clare will also be launching her newest volume of Sock Anatomy and signing copies at the crawl. You can turn up on the day, you can join a lucky dip group of other yarn crawlers, you can even volunteer to lend a hand. Check out Jess’s facebook page for up to date news! I will be going to the crawl and looking forward to the weekend very much! Jess also lets slip that the wonderful Neighbo(u)rhood Sheep Society rare breed yarn and pattern clubs will become an annual club. Blacker Yarns are soon to release a brand new yarn, just in time for your summer knits. Lyonesse, named after a mythical land that is said to have been sunk off the coast of Cornwall, is a Falkland Corriedale wool and linen blend, which has been worsted spun for a smooth finish. I decided – amateur weaver as I am these days – to warp it up on my sample loom and give it a whirl. My first impressions were of the softness of the wool and how creamy it felt through the fingers as I warped the loom. Listen in for my full appraisal of the yarn, which will be available on May 1st, in range of 6 summery colours in both 4ply and DK weights, costing £5,75 per ball. 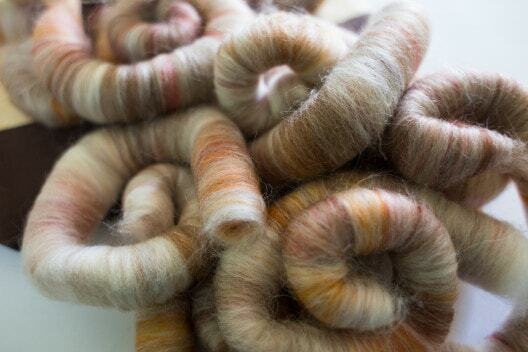 No casting on this week, but I have been spinning with some awesome rolags from Fondant Fibre. Deb sent me these awesome Shetland, alpaca, merino, and silk rolags in Toffee Apple and they have been spinning like an absolute dream! 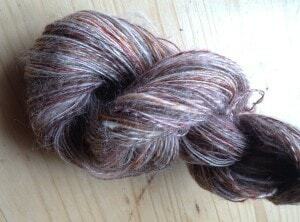 I have never spun from rolags before, usually combed braids or batts, and I have spun 30g in one evening sitting! Deb had a shop update this week and you can use the code MORESTASH for a wee 10% discount in her shop. This has been an amazing KAL so far and I can’t believe the amount of hap-ers out there. The hap chat thread is bursting with chat, with inspiration and great images and I am blown away by the effort and embracing of the hap design. Last weekend it was so warm here I did some wild knitting and took my hap on the road. it’s not too late, you can still join in as the cast off date isn’t until 12th July! We will also have another #hapalonghangout on twitter. IG and Ravelry soon to keep up the excellent momentum of this KAL. I will be back in a couple of weeks, perhaps with an interview I did at Jamiesons of Shetland – till then keep happing, keep chatting and check back on the blog later next week for a post on the wool tasting I hosted at Edinburgh Yarn Festival. By coincidence I’m in town on the weeked of the Yarn Crawl. Ii’ll try and get a spot at the sock party. Really do hope to see you….will you be at the evening party on Sunday? Hey! great coincidence. I have plans for the saturday evening, so won’t be going to the sock party, but will be out on the sunday!